Since the creation of the Venezuelan health mission Barrio Adentro, thousands of Cuban medical professionals have provided quality health care for some of Venezuela's poorest communities. 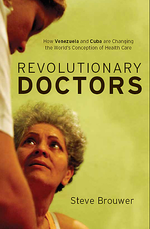 In Revolutionary Doctors: How Venezuela and Cuba Are Changing the World’s Conception of Health Care (Monthly Review Press, 2011), author Steve Brouwer highlights the revolutionary health care practiced by Venezuela and Cuba. Brouwer lived in Venezuela in 2007-08 where he witnessed the results first hand. "In my little village of 700 people, there were nine young people going to medical school, in a tiny village in the foothills of the Andes," says Brouwer. In the following interview with NACLA, Brouwer describes his new book and explains how this is more than just an experiment in medicine. "It's an ideal experience in showing how you create an active revolutionary alternative and how people, from the ground up, acquire the skills, the motivation, and the tutoring from mentors who know what they're doing, to be able to carry out building a new kind of society," says Brouwer.